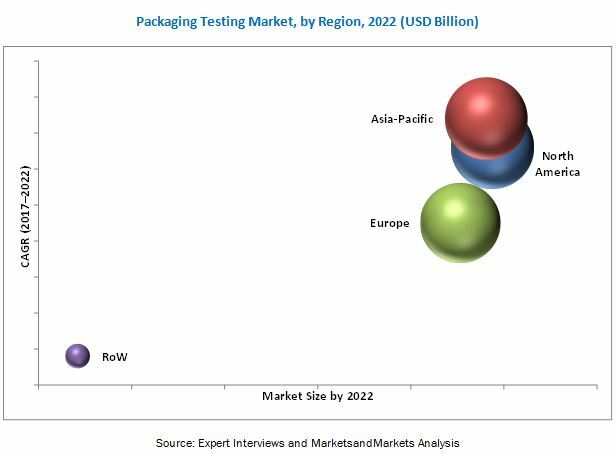 The global Packaging Testing Market has grown exponentially in the last few years. The market size is projected to reach USD 14.64 Billion by 2022, growing at a CAGR of around 12.0% from 2017. Emerging countries such as India, China, Japan, Brazil, and Argentina are the potential primary markets of the industry. Factors such as rising awareness and demand for sustainable packaging, increasing retail industry with increasing demand for packed products, stringent regulatory environment, and the emergence of new technologies are the major driving factors for this market. Moreover, the requirement for longer shelf-life of products helps to drive the growth of the packaging testing industry.